Our 40’ x60’ tent is one of the most modern style tents you can rent in Southeastern Ontario, providing: interior spaciousness, elegant DOUBLE peak design, and a 22’ cathedral ceiling. The unique one piece center poles allow for quick setup and break down. They are also more cosmetically appealing than multiple piece center poles . This tent features a very unique and elegant design. This 2400 square foot tent can be used for many different applications, including but not limited to; fundraising events, small festivals, mid sized weddings and a wide array of 125+ people parties. This tent requires 52’ x 92’ space (footprint) for staking. The tent features a three piece seamless appearing top that is made of 16 oz. vinyl and laminated polyester to block out the sun. The installation is quick and easy, allowing you more time to setup your tables and chairs. We provide ‘double web ratchets’ at each corner of the tent to assure uniform tensioning. Solid and cathedral windowed walls are also available to add weather protection and style. Fluted aluminum side poles provide a high quality modern look compared to the traditional wood poles that are prone to scratches. Perimeter lighting can also be added to help make your evening events safer and appealing to your guests. 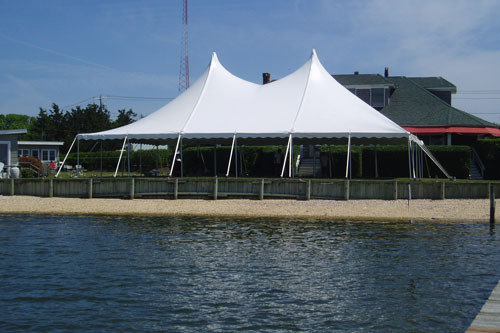 40’ X 60’ tents can seat a maximum of 192 guests around our 60? round tables, 240 guests around our 8' banquet tables, and 300 guests with chairs only (ceremony seating which includes isle). Remember that these are MAXIMUM numbers. Round tables take up 100 Square Foot, Banquet Tables take up 75 square foot, and ceremony seating takes 8 square foot per chair. If you are unsure of of the appropriate tent size for your event, please call us and we can help make the proper selection. One of our experts can also help you with your layout, calculate typical square footages for many common tent concessions: DJ, photo booths, gift tables, etc.